Even in the multiple WIP deadline reality over here at Studio Chic, we’ve had to make time lately to get our space ready to move. One of our friends has been working with us to de-clutter the whole house and it’s kind of amazing what keeps surfacing. In the middle of all this, because even a work horse has to occasionally stop moving so much and chew or flick, I’ve been making progress on my cotton/wool Vonica. 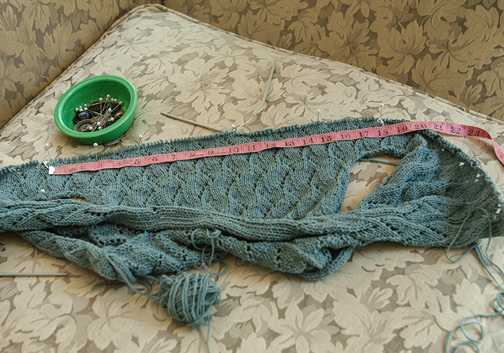 It’s at about 3″ after all the yoke pieces are joined together and now that there’s some fabric to work with, it seemed like the natural time to STOP and check the garment dimensions. 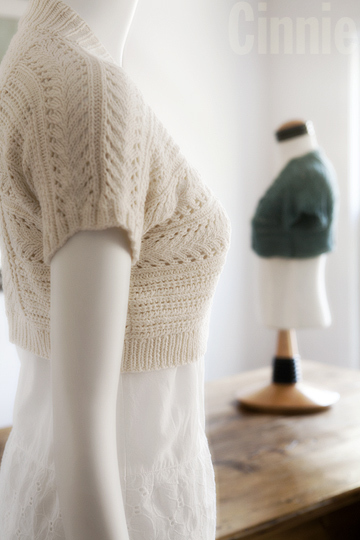 – I almost always knit things using circular needles, preferring them because they allow for a comfortable, flexible pile of fabric that can rest in one’s lap, even when something has lots of stitches. – Then, I spread it out on a cushion. Using my hands, I position and pat out the fabric so it’s as flat as I can make it, rolling the excess whose bulk rather anchors the fabric. – Now, the garment is secured at several points with one of my favorite tools: corsage pins. 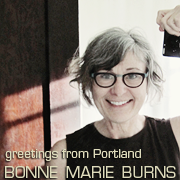 – Then, using my trusty tape measure, I check the cross-back measurement. This wonderful fabric tape measure popped up while I’ve been de-cluttering the studio. It was in a box I’d dragged home last year from my mother’s house and it had: my first communion purse (that had a little prayer book inside); my junior high school clarinet; my high school year books; and a wicker sewing box full of this and that. What makes this sort of incredible is that it is actually from my sophomore year Sewing Class! Back to my knitting: it was with great pleasure and relief to read the result on the tape. One of the best feelings out there: finishing a project. One of the worst feelings out there: ditto. Lucky for me losing that post-pro envy is as easy as picking up the needles and starting one for myself! 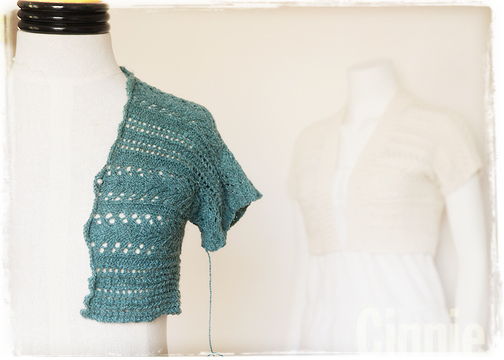 Here’s my CINNIE that I’m making using some Silky Wool in a gorgeous color they call: Verdigris. The whole Cinnie adventure started because I, like many of you, live in a place that has incredibly schizophrenic weather (ie. the “Wait-10-Minutes-and-It-Will-Change Zones). I winced thinking of all the upcoming weddings, proms, garden dates, concerts, etc. all populated by lovely ladies shivering and bunched up trying to ward off the evil chill. Who isn’t sick of goose fleshy upper arms (which, imho, might not be ready-for-prime-time on all occasions anyways); weary of being in a restaurant or at the movies when suddenly attacked by some rogue air conditioning; bored by having to guess which way the wind is going to turn (it’s Chicago! It’s everywhere and it’s going to smack you down (then snicker)!)! Not this knitter. Get up with the needles and on with some style! My fascination with no-sew construction led me down a newer path this time. 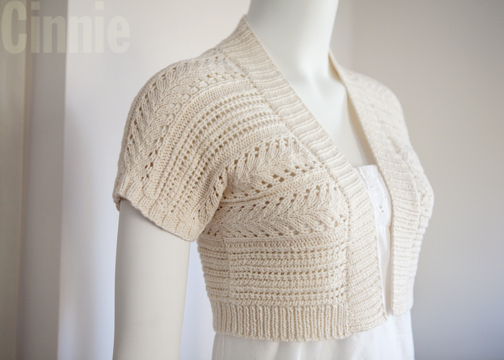 CINNIE has some side-to-side knitting that is fast and fun to do. 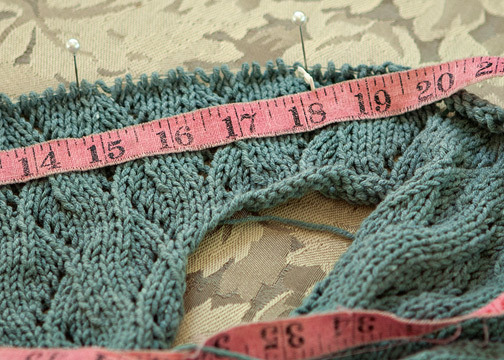 I’ve become a huge fan of what many refer to as a modular knitting where stitches are picked up on already worked areas then continued to make another area of the garment. Picking up stitches is one of the most wonderful techniques to develop and master. It’s used on almost anything you can think of and once you get going, it is fast and neat. My friend Eden was over the other day and we were enjoying some tea and afternoon knitting and she asked me to show her how to do it. I love it so much I’m tempted to start “sewing” my knitting together by combining that technique with a couple others. Join nature’s party and capture the essence of this warmer season with a fresh new look! Its a love affair with lace in a beautiful contemporary design. Featuring easy-to-knit patterning and a a unique but simple no-sew construction, Cinnie is a great addition to your warmer weather wardrobe. I was wishing for a little cardigan to throw over a cami or tee and decided to just come up with something new! CINNIE Includes directions for a long version, perfect for day-to-day office wear & a sassy cropped version, ready to step out on the town or walk up the aisle!